Her contribution to natural sciences in South Africa and Africa was considerable. The early years of her married life were dedicated to recording bird sounds. She painstakingly and meticulously made the first long-playing records of birds sounds. 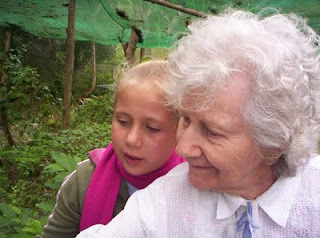 June produced a large body of work across a range of media formats, culminating in her final and recent book “Birds Sing for Us”, and her more personal, “Memoirs of an Octegenarian”. “Birds” was dedicated to John, her beloved and sociable companion who was by her side as they travelled through nature, closely observing wild creatures large and small in South Africa and African reserves and wilderness areas. 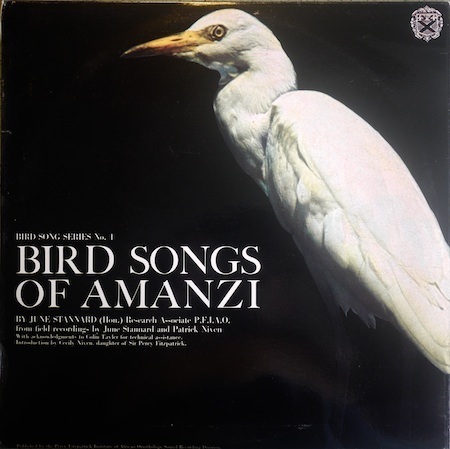 The book traces African birds and animals, their sounds and behavior, as she experienced them throughout her life, bringing wildlife closer to human ears, eyes and hearts. 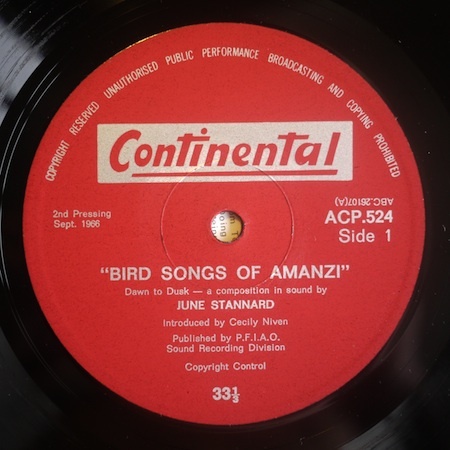 After moving to the Eastern Cape in the 50s where John worked as the deputy manager of the Eastern Province Herald’s advertising department, she quickly became an expert amateur ornithologist, and then moved into solid research as a bird listener and tape recordist. 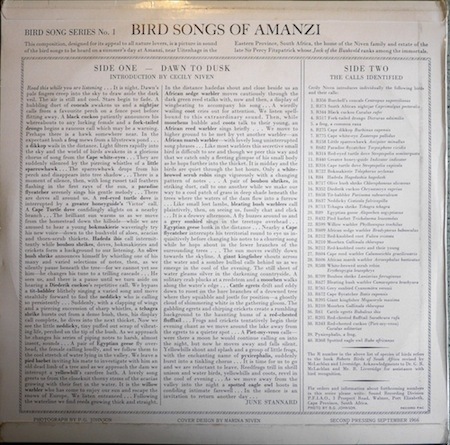 She spent days and nights on the Niven’s Amanzi Estate and in Eastern Cape forests with her recorder and primitive hand-held microphone, recording the songs that became her long-playing records of birds sounds, Bird Songs of Amanzi and Bird Songs of the Forest. She and John were keen supporters of the Port Elizabeth Museum. June went on to establish the first Library of Bird Sounds, Song & Calls in SA. The library was the third in the world – after Cornell University and the BBC.